The Universal Bibliographic Repertory (Répertoire bibliographique universel – RBU) was in its time perhaps the most important work of the International Office and Institute of Bibliography. First, because it gave the initial propulsion to the work of the institution and then because of the size that it attained and the success that this represented. The RBU was organised to respond to two basic questions “What works have been written by this or that author?” and “What has been written on this or that subject?”. Because it was universal in its scope, it was to provide responses without restrictions of time, place or language. 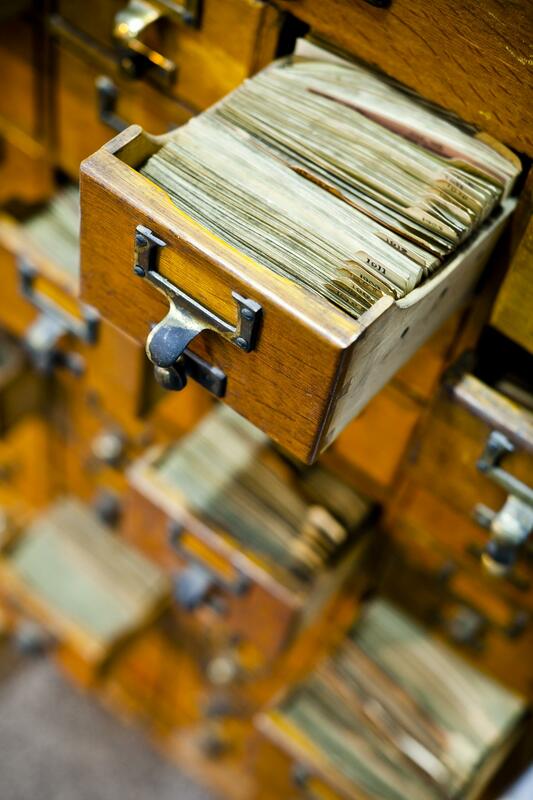 By 1934 nearly 16 million cards had been collected and classified in the RBU. The elaboration of a work of this size, complexity and international scope, required the adoption of standards both with regard to bibliographical cards and to their arrangement in card cabinets.The problem of the subject arrangement of the cards was met by the Universal Decimal Classification,. The systematic tables of the classification gave each subject, often minutely specified, a number. Cards were organized according to these numbers. The Universal Bibliographic Repertory was not a single repertory or dictionary catalogue of the kind found in American public libraries. It was divided. The author or name file was identified by the letter N. The subject file was identified by the letter A and provided information on publications that deal with a particular subject. Besides these principal files was a file for periodical titles (NR), a file for book titles (NT) and also an administrative file (K). The last is now a source of essential information on the activities of the IIB. Everything was listed on cards in this file: letters received, information about the management of the staff, publications, the inventory of collections. Since 1998 some of the filing cabinets for the RBU have been used as a design feature for the Museum part of the Mundaneum.